650 targeted farming families were provided plant samplings for the tree plantation campaign. Right holders with their plantation packages. Community members engaged in planting trees’ sample provided by the food, security and livelihoods project team. 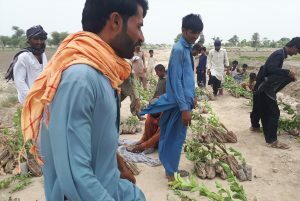 Plant samples were distributed among 650 farming families in Badin. 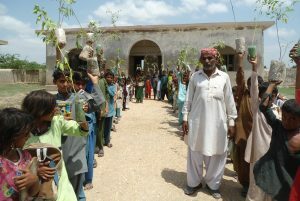 Plant Distribution ceremony among communities in Badin. Arboriculture campaign with teachers and students in a local school. An aeroculture campaign was launched with the farming communities of Khairpur Gambo and Pangrio cities of the Badin district in Sindh earlier this August under the Food Security and Sustainable Agriculture project. This was part of an annual activity planned to promote and enhance biodiversity and to mitigate the adverse impacts of climate change. As a sustainable outcome, this campaign aimed at providing an alternative livelihood source to the water-deprived farming communities of the area. These activities will also enhance the provision of fodder for the communities’ livestock, which is currently in high scarcity. 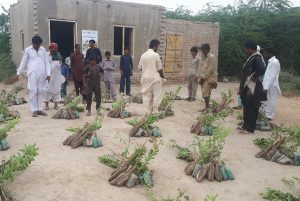 A variety of fruit and plant saplings such as Sapota, Lemon, Azarirachta indica (neem), Moringa, Falsa, Jujube and Guava, were distributed among 650 targeted agrarian families of Khairpur Gambo and Pangrio city. As many as 10,400 samplings were given out during the campaign that chanted the slogan “Let’s make a promise to grow more trees”. 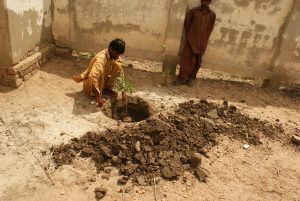 Each family were given two saplings each of, lemon, neem, moringa and jujube and three of falsa and guava. A week earlier to the distribution, the families were demonstrated on how to plant the samples in the soil. They were also oriented on all the possible measures adopted to ensure the healthy growth of the plants. 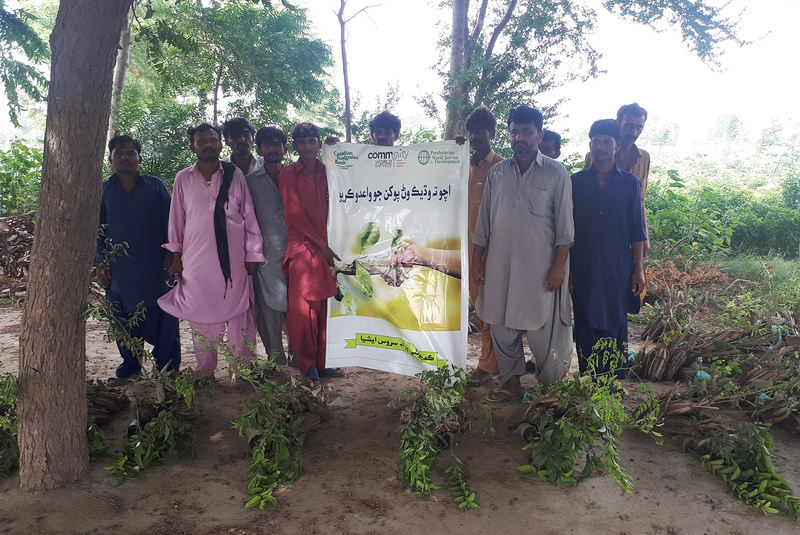 The categories and species of the plants and fruits were selected with consent and suggestion from the communities and upon recommendations given by the Forest Department in Badin and the ARID zone agriculture institute. These particular types of plants and fruit were selected as they could grow well without a lot of water and could tolerate a certain level of water salinity, which was present in the water available here. The trees planted under this campaign will bear fruits between two to four years, allowing the farmers to benefit from the sustenance it will provide, as well as reviving greenery in the area, cleansing their environment and building the community’s resilience to climate change impacts. A method of growing plants without soil by suspending them above sprays that constantly moisten the roots with water and nutrients. 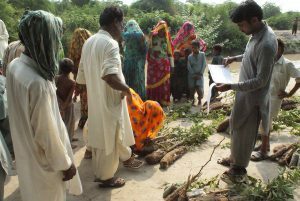 Promoting Sustainable Agriculture Practices to Improve Food Security and Livelihoods of Vulnerable and Marginalized Farmers of Badin.